AHAVA Purifying Mud Soap Even it is a rich active blend of Dead Sea mineral mud and other natural ingredients that deep-clean and recondition facial skin. Regular use will keep your skin moisturized, supple and youthful. Size: 100 g / 3.5 oz. 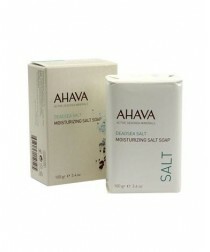 AHAVA Moisturizing Salt Soap a unique blend of Dead Sea salt and minerals that gently but thoroughly cleanse facial skin, this great soap will keep your skin radiant for hours. Its moisturizing ingredients restore skin moisture to optimal levels. Size: 100 g / 3.5 oz. AHAVA Eye Makeup Remover formulated from the ultra-nourishing properties of Dead Sea minerals, this highly effective makeup remover will leave your eye area silky soft and crystal clean. It is a wonderful water-and-oil-based product that removes even hard-to-remove eye makeup without drying out the skin or leaving a sticky residue. The addition of Aloe Vera, Bisabolol, Calendula and cucumber extract raises eye skin moisture to optimal levels. Size: 125 ml / 4.25 fl. oz. 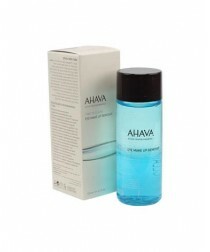 AHAVA Mineral Toning Water enriched with Dead Sea minerals, botanic extracts and with AHAVA's propriety Osmoter™, this soothing and calming Toning Water leaves skin feeling fresh, supple and moisturized. Suitable for sensitive skin. SLS/SLES and 'paraben' free. Size: 250 ml / 8.5 fl. oz. 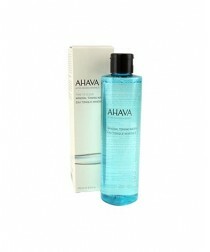 AHAVA Refreshing Cleansing Gel purify and condition your facial skin with this Dead Sea mineral-rich foaming cleanser. Scientifically formulated to remove makeup and all other impurities, it will imbue your face with a fresh, youthful glow. Size: 100 ml / 3.4 fl. oz. AHAVA Facial Mud Exfoliator nourish and hydrate your facial skin with this wonderful Vitamin E-enriched cream. You'll have a younger, fresher look and your skin will be protected against the elements. Size: 100 ml / 3.4 fl. oz. 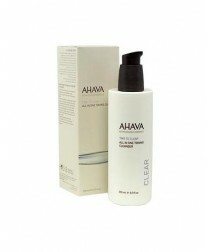 AHAVA All in 1 Toning Cleanser a special 3-in-1 face care product eliminates impurities as it fights the ravages of time. It is a high-performance cleanser, toning milk and makeup remover that gently washes away the impurities as it refines skin texture for a bright healthy glow. Size: 250 ml / 8.5 fl. oz. 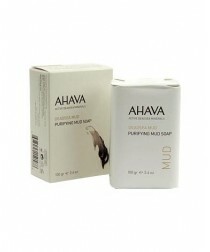 AHAVA Purifying Mud Mask a deeper cleansing experience is yours with this innovative Dead Sea mud mask. The jojoba-enriched formula effectively absorbs excess oil, removes blackheads and prevents new blemishes. Size: 125 g / 4.4 oz. AHAVA Facial Renewal Peel based on two unique skincare technologies, OsmoterTM and CitrationTM, this rinse-off peel will revive your skin. These scientific AHAVA systems act synergistically to promote cell growth by injecting a blend of pure Vitamin C and other great natural ingredients into the skin. They mildly melt away the dead cells to reveal a stable, even-toned, youthful radiance. Size: 100 ml / 3.4 fl. oz.